1. heat up the kitchen appliance to 375 degrees F. Line a baking sheet with parchment paper. 2. Toss along the asparagus, olive oil, salt and pepper. 3. Roll the pastry sheets out on a floured surface and delve eight squares. Place a bit of cheese on every sq. then add a couple of asparagus. Take two corners of the pastry and finish and over the asparagus to surround (see higher than photo). Transfer to the ready baking sheet. Repeat with remaining squares. Brush every pastry with egg. Transfer to the kitchen appliance and bake 20-25 minutes or till golden brown. 4. Meanwhile, soften along the honey, butter, and thyme in an exceedingly tiny pan over low heat. 5. Serve the pastries heat, drizzled with thyme honey and crushed red pepper. Enjoy! 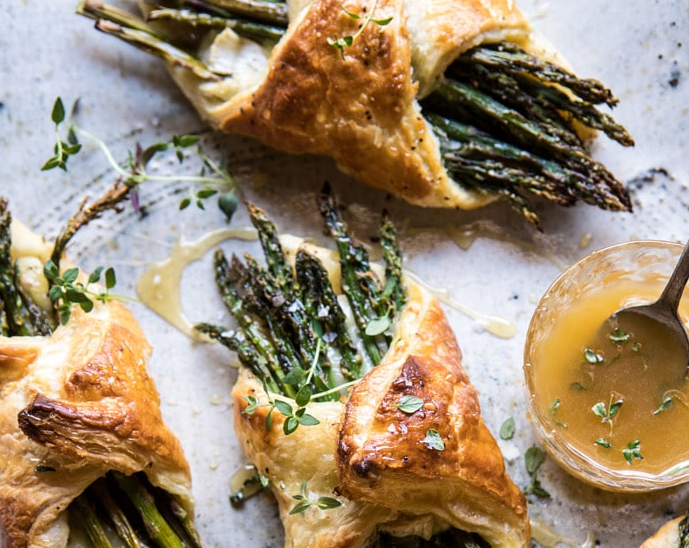 0 Response to "Asparagus and Brie Puff Pastry with Thyme Honey"